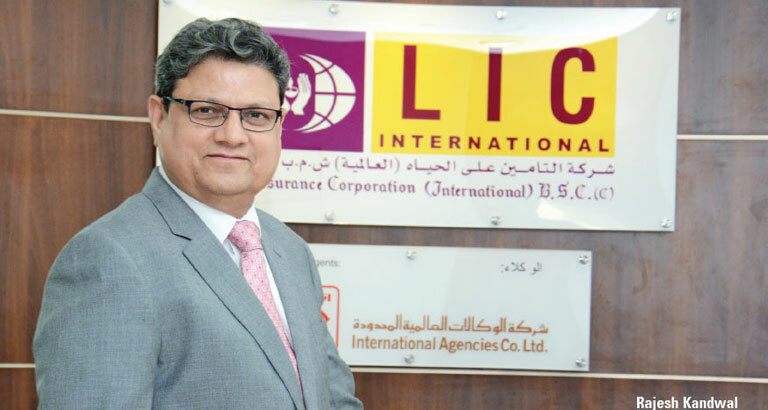 With the aim of providing life insurance cover to the Indian diaspora in the GCC as well as residents of other nationalities, LIC (International) BSC(c) was launched in Bahrain on July 23, 1989, in partnership with International Agencies Co Ltd (Intercol) and LIC of India, the strongest and largest life insurance company in India with a market share exceeding 75 per cent. LIC (International) has excelled in all areas of operation for the last 28 years and stands out as one of the most significant market players in the life insurance sector, not only in Bahrain but across the Gulf. The company’s market share has increased to 47.48 per cent in Total Premium Income and 95.03 per cent in Total Policies as of December 31, 2015. With an asset base USD1,767 million as of September 30, 2016, Mr Rajesh Kandwal CEO and managing director, says the company is poised to hit USD2 billion before the end of 2017. The reason for LIC (International)’s strength in the market is the strong connection it enjoys especially with NRIs (non-resident Indians). It has fulfilled the promises made to its customers and given them comfort at the time needed the most. It has, through its various products, extended solutions to areas such as the educational needs of children, pensions for old age and a safe reliable platform for their hard earned savings. As of December 31, 2016, the company had paid out USD173.2 million in claims. The plans are issued in US dollars and LIC (International)’s unique and wide range of products has something to meet the needs of every customer – be it lower cost life cover, attractive returns, liquidity, provision for children’s education/marriage, health coverage or pensions. Portability of policies to India is another unique added advantage for all NRIs. The company has also recently launched a Group Life Insurance Plan, suitable for various organisations, establishments and associations. The company’s goal is to give its customers convenience and quality service, therefore it has created the LIC Intl application available to download from the App store and Google Play; and on its website the company has launched a marketing software, these items ease the process of getting information on existing policies and help guide customers to choose the right plan for themselves and their families. Participating Endowment Plan (PEN) – The most popular and simple savings scheme, ideal for those looking for a plan that combines life cover, liquidity and investment. Participating Marriage / Education (PME) – A plan that allows you to make provisions for milestones of expenses in your child’s life, like education and marriage. Jeevan Anand (JA) – A unique combination of endowment and whole life with provision of payment of sum assured twice. Professional Education Plan (PEP) – A plan that provides cash back, liquidity, guaranteed additions annually, flexible premium payment, and benefit riders, ideal for your child’s education and future expenses. Deferred Annuity Plan With or Without Life Cover – A unique plan unlikely to be available with any other institution, which provides a pension throughout the policy holder’s life. Pure Term Assurance (PTA) – Ideal for those who look for pure life risk at a low premium. Future Secure Guaranteed Return Plan – The company’s newest plan that is perfect for those looking for a lump sum investment with guaranteed returns in a short period of time and life cover. In these challenging economic conditions, it becomes very important to save money and invest it smartly so that you generate returns and don’t risk losing your hard-earned savings. By investing your money in LIC (International) you are not only saving but earning returns, securing your and your family’s future. It is a win-win situation. With the company’s strong position in the market, you can invest with confidence. LIC (International)’s slogan is ‘We Insure Lives, and Ensure Happiness’.